We are proud to support conferences that open up discussions on business innovation within the CEE region. 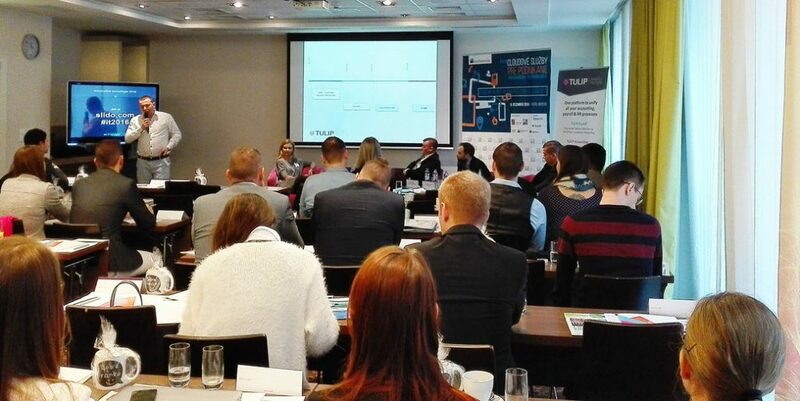 As a sponsor of the “Cloud for business” conference, we had a chance to present TULIP´s Time & Attendance module and discuss the future of cloud computing with other Slovak providers. The first block went back to the roots – explaining the cloud and answered some important questions that customers might ask – Is it better to rent or to own a cloud solution? What the different types of cloud computing are and which one best suits my company? A very interesting insight into cloud computing from a customer´s point of view was given by Miroslav Pikus from Slovak Telekom. He presented a case study of their own cloud migration and highly recommended it to the audience. The TULIP presentation was part of the second block. Our Managing director Viktor Mečiar spoke about Time and attendance in cloud, It´s one of the most popular activities that customers often move over to the cloud. We surprised the audience with the fact, that many big international companies had previously used excel sheets before they moved to more sophisticated solutions like TULIP. All of the presentations tried to help customers on deciding which kind of cloud solution is best for their business. There was never simply a question ‘if to use the cloud’, It´s because we all know that it’s not possible to avoid it. Almost every company is now using the cloud in some way and they have to, if they don´t want to be overtaken by the competition and also move forward in their business development. The third block was about something that cloud providers have found beneficial. Slovak and European legislation is something that we deal with every day when supplying our services. Learning how to solve certain crucial issues from legal experts was extremely helpful. The conference showed that there are many good cloud companies within Slovakia already and that customers are generally very satisfied with them. But there is still some scope to educate firms further about the value and safety of cloud solutions. Slovak companies will need to develop trust in them to go full steam ahead into the cloud. But one important thing to remember – the cloud won´t solve your problems if the processes or architecture of the company are incorrect. Previous Post How did the “Elektronické účetnictví 2016“ conference go and what have we learnt? Next Post What did TULIP achieve in 2016?